Why should I use USP source instead of the big name consulting companies? What are the activities of USP? For which product lines can USP act as a sourcing office? Which geographical area does USP specialize in? How can USP cater to very different product lines? Will I get direct supplies from the manufacturer? How does USP qualify vendors? Can USP provide photos of vendor processing? Can USP arrange for visits to vendor plants? Can USP take up supply inspections? Can USP take up specific assignments? Can USP visit vendors for specific assignments? Can USP take up activities with our existing vendors? Can USP source from other parts of India? Does USP follow & check for ethical practices from the vendors? Does USP understand and comply with Western practices and standards? What is my benefit when I contact USP? In the world of Engineering anything can be made. We have the clients on one side who are in need of a range of services / products. On another side we have the manufacturers who have the product but are limited by geographical / linguistic / financial constraints as far as the market is concerned. All said and done, the biggest challenge in a business environment is still sourcing the right product most efficiently. Efficiency - in-terms of quality, time, and cost. Letting the customers do their core business and bringing the products / services to their doorsteps is a very value added requirement. We at USP (Unique Source Point), do exactly this. Ours is a dynamic organization located in Coimbatore, South India  the manufacturing hub for Engineering and Textiles. We have well qualified and industrially experienced Engineers and Management Graduates to bring out the best techno-commercial results. We maintain quality and equality for products, standards, and delivery schedules. USP is most suitable where flexibility and economics of the service are considered. We are an efficient and very flexible organization. We maintain the cost of service at very affordable levels by keeping our overheads very minimal. USP DOES NOT HAVE MANUFACTURING FACILITY OF ITS OWN. USP acts as a remote local office for the buyer to deal with suppliers a a fraction of the cost, time and efforts otherwise needed. For which product lines can USP act as Liaison office? Coimbatore – an industrial manufacturing hub located in the South of India, is becoming increasingly prominent for global players to source from. India is such a diverse country, not only in terms of people, culture, terrain, climate, food, language, appearance but also for industrialization. North East West South - each region has its own production / knowledge / resource / specialization and business nature. Knowing this and applying it practically in operations has made us successful in sourcing PAN India. As mentioned prominently in the website, USP is acting as a local consultant for CBI from the Netherlands for three of its Engineering Programmes. As a part of this assignment, we have registered and audited various manufacturer suppliers to evaluate their exportability to Europe. This has led to relevant experience and we have since developed a good network in very different product lines. Yes. As a buyer you will get direct supplies from the manufacturer / supplier. USP will be acting as a coordinating agency. If the client has specific vendor evaluation forms / practices, we can adopt to such practices for evaluation.If the client does not have specific input, with our experience and self designed assessment forms we can qualify companies to assess their fit for exports and more specifically for your requirement. If the vendor allows, USP can make digital photos of the general infrastructure or specific process as required by the client and mail it as soft copies. Yes, USP can arrange for vendor visits and coordinate activities in aspects like pre audits, final audits, booking hotels, arranging travel to factory, organizing meetings, local communication, and required business facilitations. Yes, USP can take up supply inspections. In fact, we can handle inspections at different stages as required by the client. If the client provides custom made format for inspection, we can well adopt to it for easy analysis. As said before, we are a very flexible organization. We can take up specific / short term assignments also. Some examples: we can check for the labor conditions, we can assess if the supplier is following a process as expected by the client, calibration certificate checking, arranging for third party certified inspection. Yes, based on your requirement, we can visit vendors for very specific assignments. Yes, we can take up activities with existing vendors. 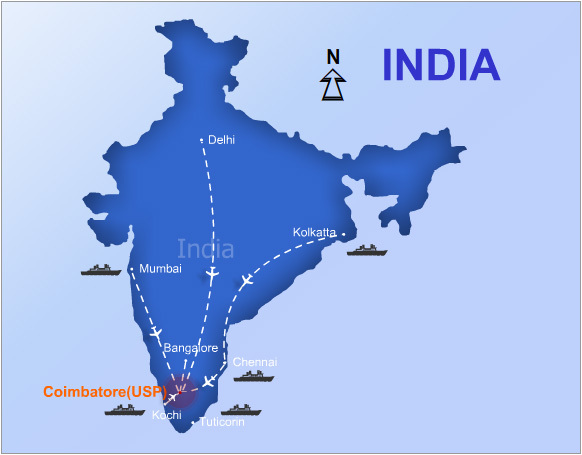 USP is used to sourcing from other parts of India as well. Yes, USP can source from other regions across India. This has been and is one of the main strengths of USP. USP follows good ethical practices. We also expect the same from the vendors we advocate. Any particular checking can be done based on the input from the client. Yes, we do, as much as we know. It is anyhow suggested that the clients provide the complete requirements without any assumptions. USP has flexibility as its core strength. This applies to the cost of services / products also. We wish to involve continuously in any business we initiate. Based on the client convenience, we can arrive at a cost on case to case basis. Based on our experience with global clients and local vendors, we can strike the very optimum balance. When you contact USP, it is like establishing your local office here. So, any type of information you can get with reliability and efficiency that can never be matched otherwise. All this at a fraction of the cost and time it would take for you to deal directly. Of course, there is the continuous support function USP will contribute to. How can we contact you for more information or clarifications? I am planning to visit USP in India; can you give me information about it?